Berrington | What Sets Us Apart? The idea of a nursing home arose out of the hospital system where there was a need for those in their golden years, that required nursing care, to receive this care outside of the hospital system. Often high nursing care needs meant that their home was not an appropriate setting to receive this higher level of continuous nursing care. Instead, they moved into a facility with a strong medical environment: a nursing home. Nursing homes were set up to function just like a hospital, with the same look, feel and staffing structure that a hospital would have had. 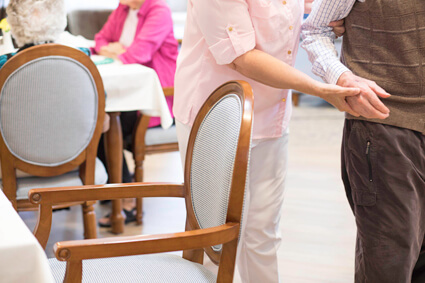 Often, the choice about how a nursing home resident wanted to live wasn’t given a high priority, moreover nursing homes were structured around nursing processes and routines, leaving the nursing home resident feeling helpless and powerless. Berrington, was born from a completely different belief. When you cannot remain in your original home, you deserve to move somewhere that is comfortable, well-appointed, warm and welcoming, easily becoming your new home. While still providing services such as nursing care (and much, much more), both of our Berrington locations give you a place to live that many liken to being aboard a cruise ship or like living in a boutique hotel; with nursing care provided. Your every want and need are catered to at Berrington. You’re not just here to keep living; you’re here to get the most out of your life and feel excited about each new day. We emphasise the highest standard of service, exceeding your expectations at every turn. The vision to create our facility came from our owners, Glen and Karen Gillingham. We believe in the idea that you can live a fuller, richer life well into your golden years. Berrington is a place you can come home to, where the hard work you put in for years has given you the possibility of reaching the pinnacle of comfort and luxury. If you’d like to learn more about our incredible lifestyle offered, call Berrington on 1800 237 746.